I sat down with Masten District Council Member Demone Smith on Wednesday afternoon for a few minutes to talk about the new regional land bank application and the supporting legislation. The package is heading to Albany this week for the Governor Cuomo's final approval. 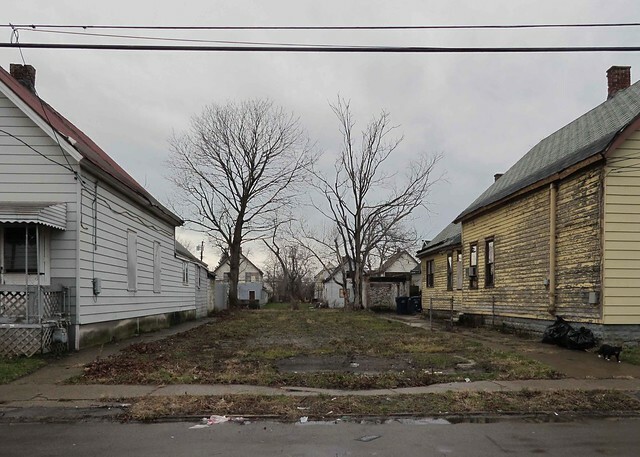 According to Demone the Buffalo Erie Niagara Land Improvement Corporation (BENLIC) is characterized by strong regional intermunicipal cooperation and reflects the Governor's desire for local governments to address the issues of abandonment, sprawl and vacancy together. Demone began our conversation with his take on Buffalo as a "shrinking city" and the need to focus assets and capital projects in core areas. 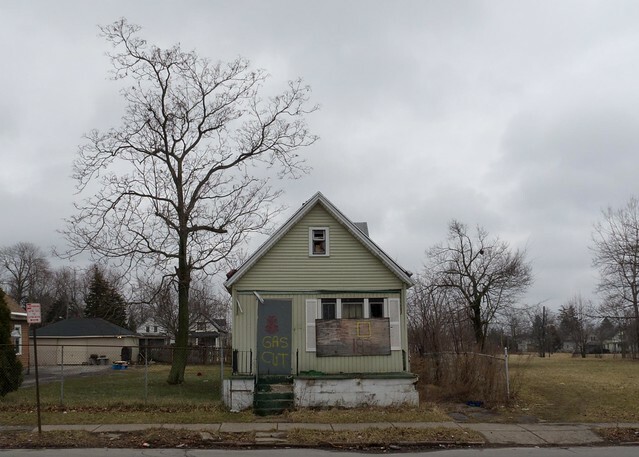 Two years ago Artvoice posted a story about Buffalo's Demone Smith's thoughts regarding the intense public policy changes that have taken place in Youngstown, Ohio. Here's that post - Learning from Youngstown - Part II (January 2010). Demone Smith, Masten District Councilmember, submitted the following resolution authorizing the creation of a regional land bank. 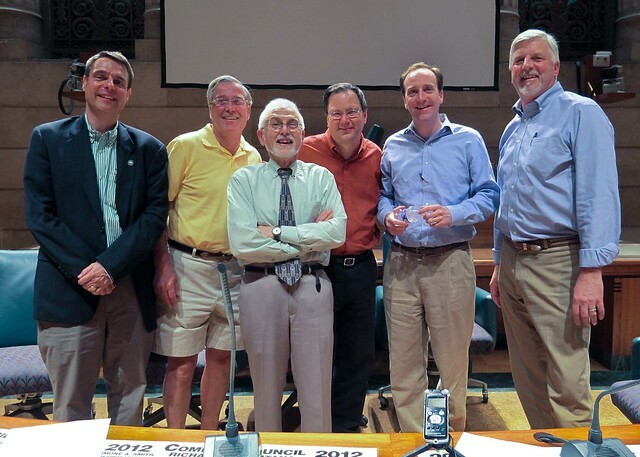 The resolution was unanimously approved by the Common Council last Tuesday. Erie County is on board, so are the Cities of Lackawanna, Niagara Falls and Tonawanda. Michael Clarke, Executive Director of LISC-Buffalo, told me in a conversation this morning, "...this is a very strong cooperative agreement and an important step forward in dealing with abandonment and vacancy on a regional level." The resolution is part of an application that the City and County are submitting to New York State later this week. New York State's Empire State Development issued the request for proposals. According to Michael Clarke the strong inter-municipal cooperation spelled out in the resolution for the Buffalo Niagara Land Improvement Corporation is something that Albany expected. LISC-Buffalo have been at the leading edge of the policy development in dealing with these issues. Six years ago LISC-Buffalo published Blueprint Buffalo (2006) which helped set the stage for this critically important policy shift. To see the individual photos and related maps, follow this link this link or you can view the series as a slide show. The weekly series is archived at Seeing Buffalo. 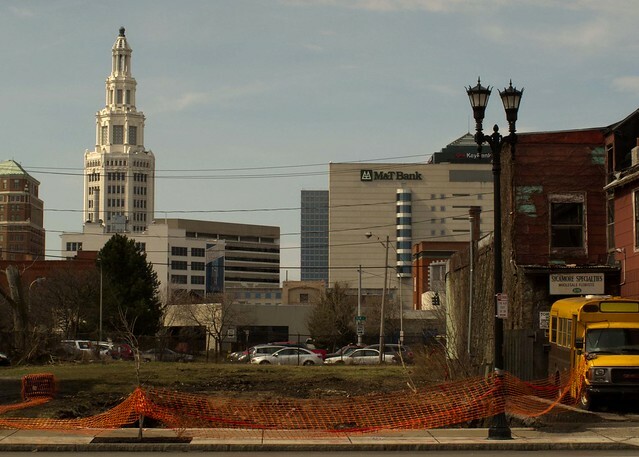 The latest installment in the Buffalo Green Code is set to be rolled out at ECC’s City Campus on April 10, 6:15 pm, when the Mayor’s Office of Strategic Planning and its consultant team will outline the proposed approach for the new zoning code. Here’s the PDF of the City’s four-page policy brief. fixBuffalo readers will remember the Green Code's official announcement on Earth Day, April 2010. Additional Green code posts are available here: Green Code posts. Last night the City's Preservation Board voted unanimously to support the local landmarking of Trico Plant #1. 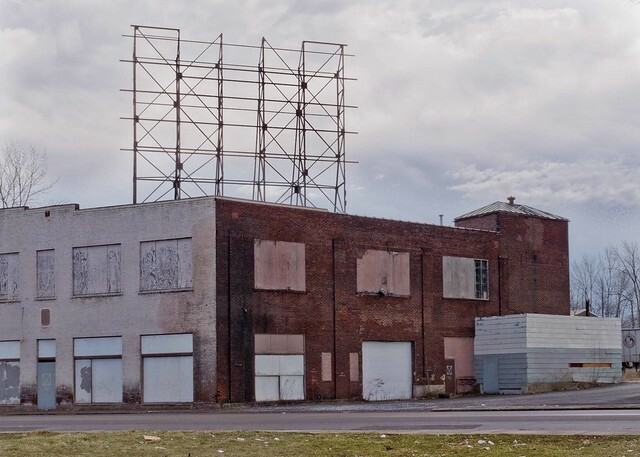 Ellicott District Council Member Darius Pridgen was present and heard seven Buffalo residents speak in favor of designating the historic Trico Plant #1 a local landmark. Daniel Sack spoke on behalf of the Campaign for Greater Buffalo and two members of Occupy Buffalo added their voices to the hearing. No one spoke against landmarking. The public hearing lasted 20 minutes. Here's the full audio (mp3 after the link) of last night's hearing. Tom Yots, Preservation Buffalo Niagara's new Executive Director hosted the Trico teach-in after the public hearing at 8pm. Speakers included Martin Wachadlo, local architectural historian; Matt Entstice, Executive Director of Buffalo Niagara Medical Campus; and Doug Swift from City View and PBN board member. During the Q&A they were joined by Paul McDonnell, Chair of the City's Preservation Board and President of the Campaign for Greater Buffalo and local developer Rocco Termini. Here's the full audio (mp3 after the link) of PBN's event. Rocco Termini asked Matt Enstice how a $300/sqft price for reuse could have been established when no supporting plan for the building's reuse was ever considered. After the meeting I asked Matt Enstice several times about the planned demolition schedule and the sources of funding for BNMC's demolition plans. He assured me that this information would be forthcoming as part of a "public process". Matt also promised me a Trico tour if I was prepared to wear a special hazmat suit and respirator. 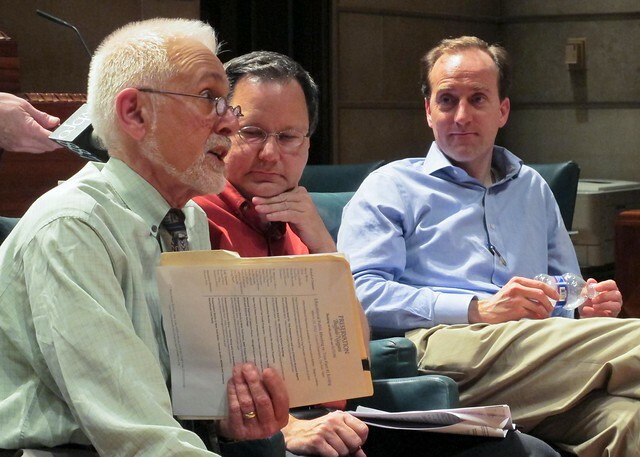 There's no word yet as to when Harvey Garrett's "preservation roundtable" will reconvene. See also: Wiping Away Trico - Part I, Part II, Part III and Part IV. 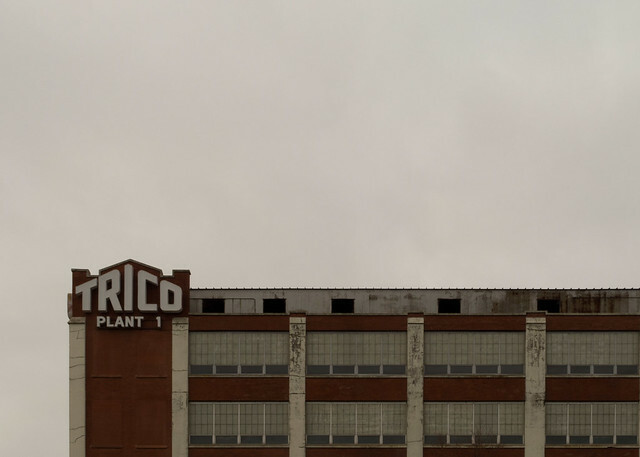 Tonight's public hearing about land marking the historic Trico Plant #1 is set for 6pm in Council Chambers on the 13th floor of City Hall. You'll want to read Geoff Kelly's Artvoice cover story Wiped Away about Trico and the City's preservation battle of the year before you attend. After tonight's public hearing Preservation Buffalo Niagara is holding their teach-in on Trico. That begins at 8pm. BNMC Executive Director Matt Enstice will discuss BNMC's future interest in the site. Here's PBN's announcement. To see the individual photos and related maps, follow this link or you can view the series as a slide show. The weekly series is archived at Seeing Buffalo. The weekly series is archived at Seeing Buffalo. Two public meetings to save Trico Plant #1 have been scheduled. The first is Thursday March 22 at 6pm in Council Chambers at City Hall. This is public hearing to discuss the local landmark application which was submitted by the Campaign for Greater Buffalo. Speakers include Ellicott District Councilmember Darius Pridgen, architect and Campaign for Greater Buffalo President Paul McDonnell, “Trico Baby,” preservationist, and small business expert Susan McCartney, real estate development expert Eric Lander, and Campaign Executive Director Tim Tielman. Learn how and why Trico Plant No. 1 must be saved, and how it can meet the needs of the Fruitbelt, Allentown and downtown, as well as the medical campus. Stay connected and current with Trico Plant #1 news via the Campaign's facebook page. I caught up with Daniel Ash the other day on Riley Street. He'd just started preparing the land and turning over the soil for the City's newest urban farm. 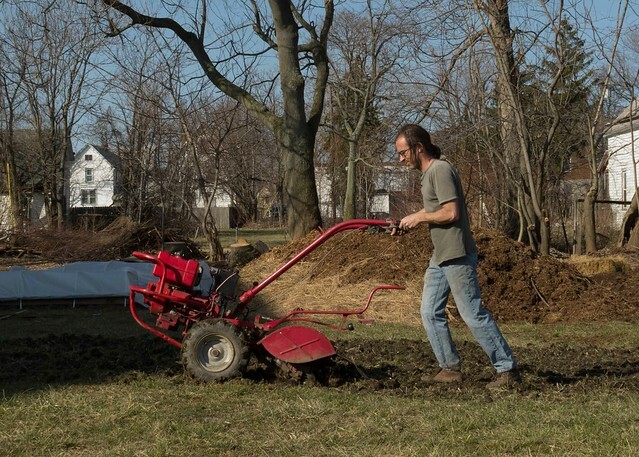 In cooperation with a number of local homesteaders, neighbors and supporters, Daniel has assembled a number of vacant lots in the City's Cold Spring neighborhood. Here's a post from the Farmers & Builders site that will help you locate their work. 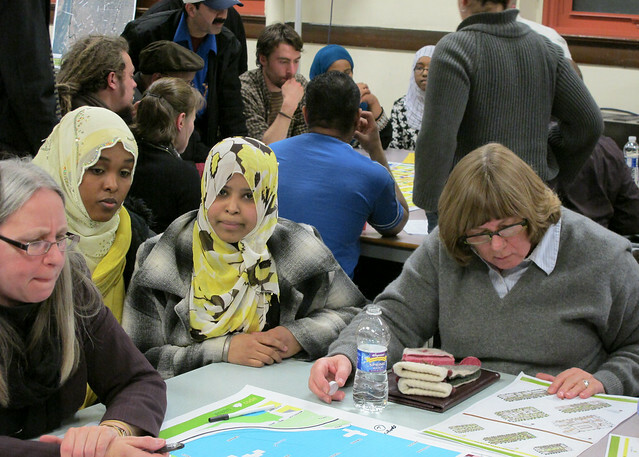 This exciting new urban experiment is also on facebook - Farmers & Builders. The City's newest urban farm is located a few blocks away from the Cold Spring Cooperative Farm. 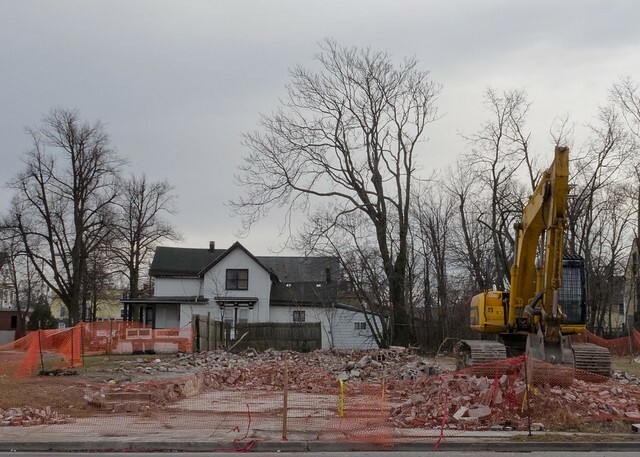 One of the last remaining pre-Civil War era residential buildings along Michigan Avenue was trucked to the landfill earlier this week. 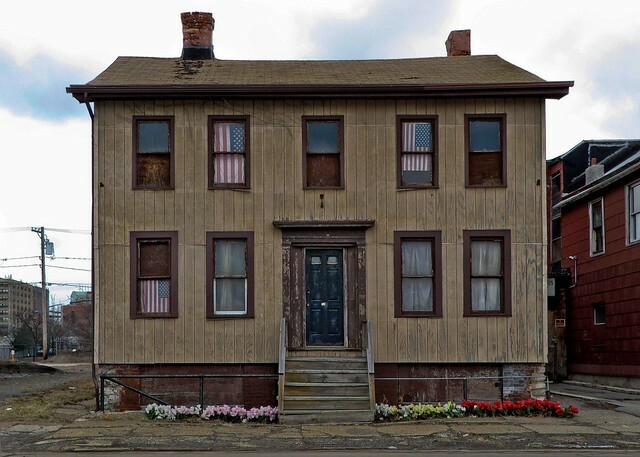 This was a house that President-elect Abraham Lincoln would have seen while visiting Buffalo in 1861. Here's what the house looked like four years ago. Two years ago 574 Michigan was on the market for $69,000 according to this Buffalo Rising post. The owners plans to renovate after the fire in 2010, gradually ground to a halt. The street improvements seen in the first image - new sidewalks, curbs, trees and lighting - represent the Brown Administration's commitment and significant investment in the neighborhood's African American Heritage Corridor. 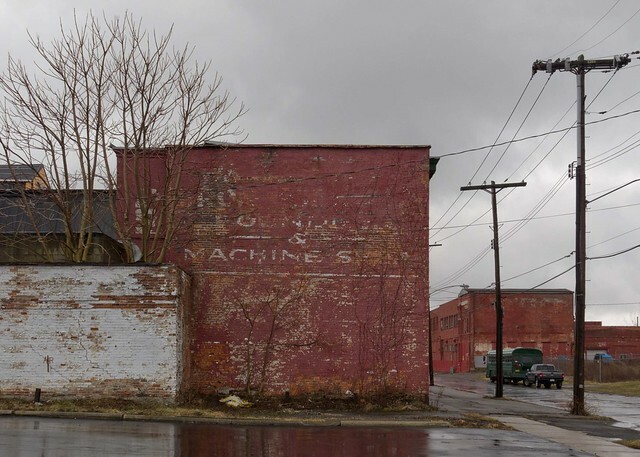 Some readers may recall the fire thirteen years ago that destroyed another neighborhood landmark and one of Buffalo's designated local landmarks one block away. Here's that story of Buffalo's fabulous Little Harlem Hotel and nightclub located at 496 Michigan Avenue. Additional background information regarding the history of this Federal Style residence can be found here - 574 Michigan: Heading to the Landfill. 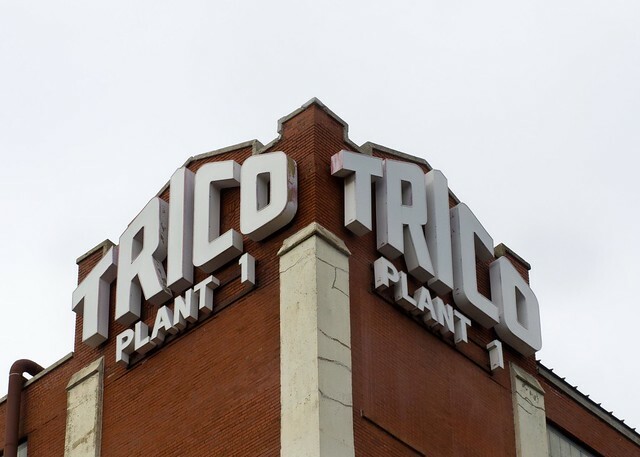 The nomination application for the local landmark designation of Trico Plant #1 was submitted to the City yesterday. Paul McDonnell, Chair of the Buffalo Preservation Board, has placed this on the Board's agenda as an action item. Buffalo's Preservation Board meets this afternoon at 3pm in room 901 at City Hall. No news yet from Buffalo Niagara Medical Campus Executive Director Matt Enstice. 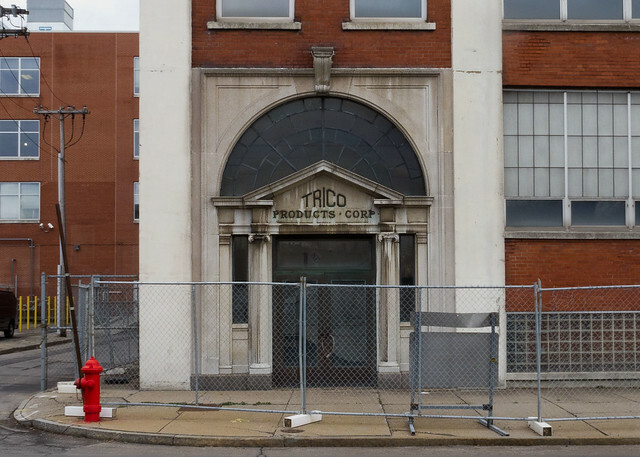 As the City's designated developer of Trico Plant #1 he's recently announced plans to begin the demolition on April 15th. The nomination application to designate Trico Plant #1 a local landmark was submitted by Paul McDonnell who is also President of the Campaign for Greater Buffalo. To stay current with the fast moving developments and critically important preservation news the Campaign for Greater Buffalo has started a facebook group Save Trico. 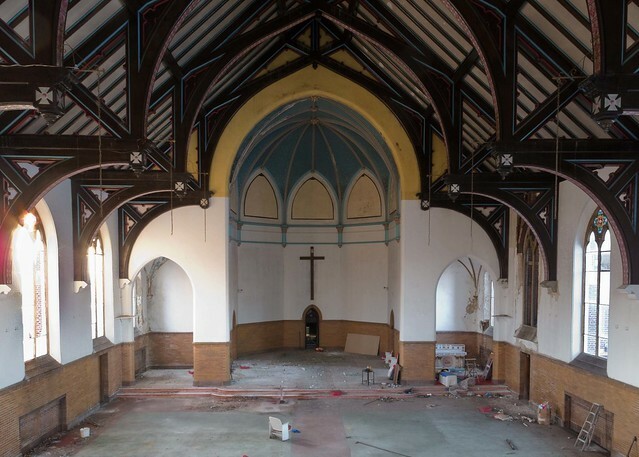 The interior of Sacred Heart Church has been stripped. 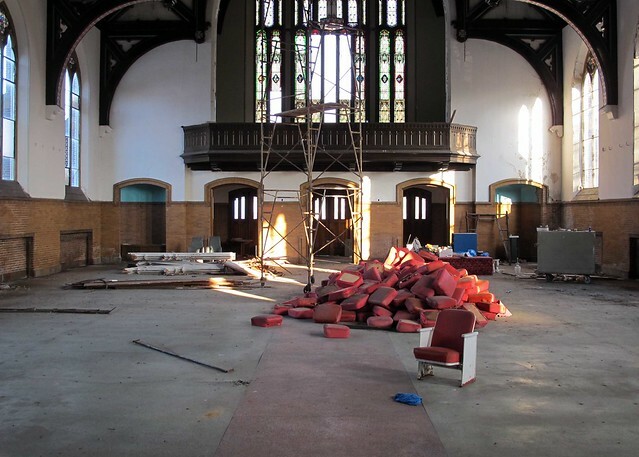 The pews and religious architectural detail are gone. 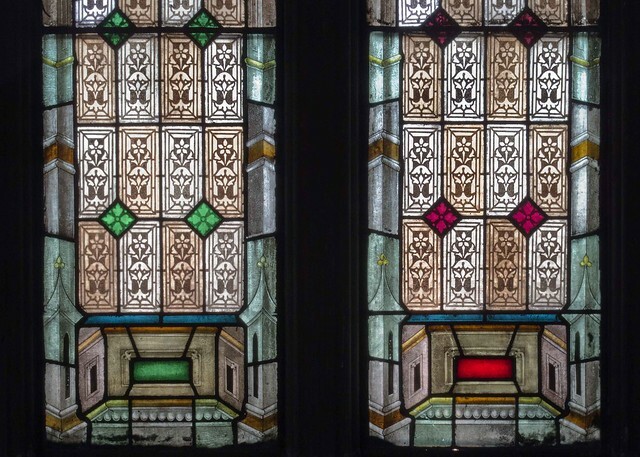 Most of the stained glass went missing years ago when a deadly propane explosion shattered the neighborhood in 1983. Dozens of slate roof tiles are missing and water infiltration is taking its toll on plaster and ornamental detail in various places in the Church's sanctuary. The attached rectory appeared to have been occupied by squatters for months. A recent water bill arrived showing that Rev. Ronald Kirk's Witness Cathedral is $23,000 past due - here. 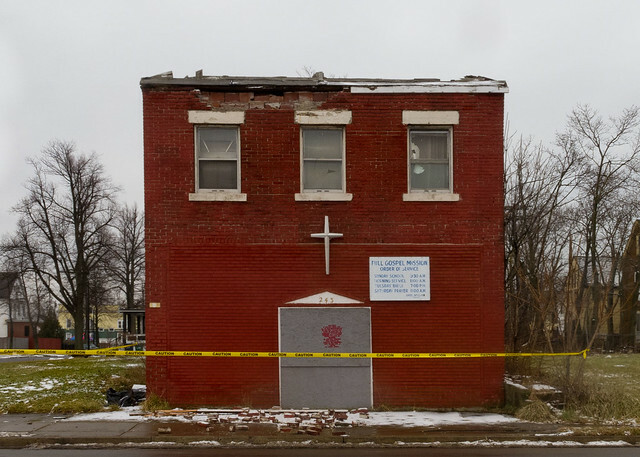 Despite the wear, open windows, running water and plaster damage the church building appeared to be in sound structural shape. The rectory was in similar condition. The convent next door was sealed shut. As of this afternoon a Housing Court warrant for the arrest of Rev. Ronald P. Kirk remains outstanding. The warrant was issued by Judge Patrick Carney almost a year ago. He allegedly lives in Derby, NY in a 7 bedroom beachfront estate (bing map). Judge Carney's demolition order for Sacred Heart Church and the City's asbestos abatement permit are in place. The fate of this neighborhood landmark remains uncertain. 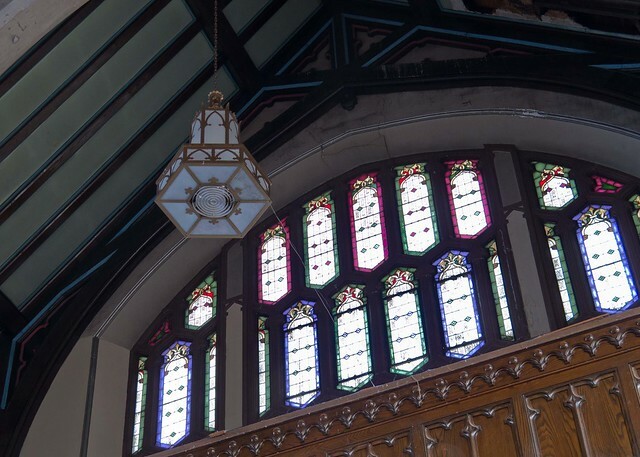 Information about Sacred Heart's remarkable neighborhood history and details about Rev. Ronald P. Kirk were covered in Slated for the Landfill - Part l.
Additional images of the church's interior are available in the Sacred Heart image archive. Six weeks ago City crews wrapped yellow caution tape around the building here at 245 East Ferry Street. I posted Another One Falling. Late last week 245 East Ferry Street was demolished. This is what I saw Tuesday afternoon. Six weeks ago the building was still salvageable. It's been owned by the same entity for 30 years, the Full Gospel Mission, Inc. According to Council Member Demone Smith's office, the minister of this congregation could not be located. I stopped by and spoke with Leroy, a long time neighborhood resident and brick mason. He lives close by. Here's his take about what happened. This was the last remaining building on the block of East Ferry between Welker and Verplanck. On a street that's been ravished with demolitions in the past few years this lovely little brick mixed-use commercial building appeared to be in fine shape. Here's another view from January looking towards the East side of the building. 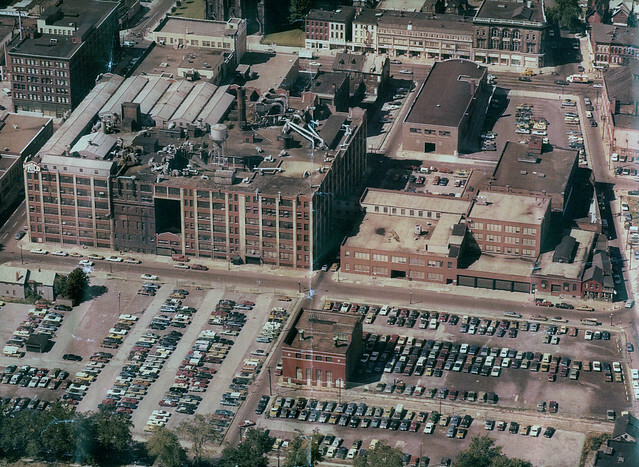 Tim Tielman, Executive Director of the Campaign for Greater Buffalo, announced today he will fight plans by the Buffalo Niagara Medical Campus (BNMC) to demolish the historic Trico Plant #1. The daylight factory at 791 Washington Street was listed on the National Register of Historic Places in 2000, making available tax credits that could offset up to 40% of the costs of adaptive reuse. 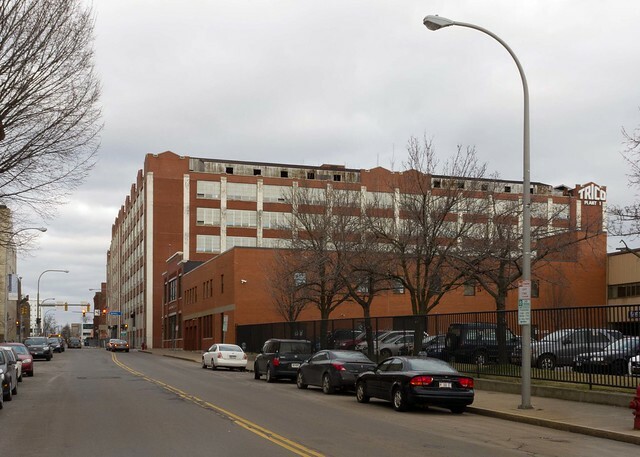 In spite of the availability of these incentives, BNMC Executive Director Matt Enstice has indicated his intention to begin demolition on April 15. 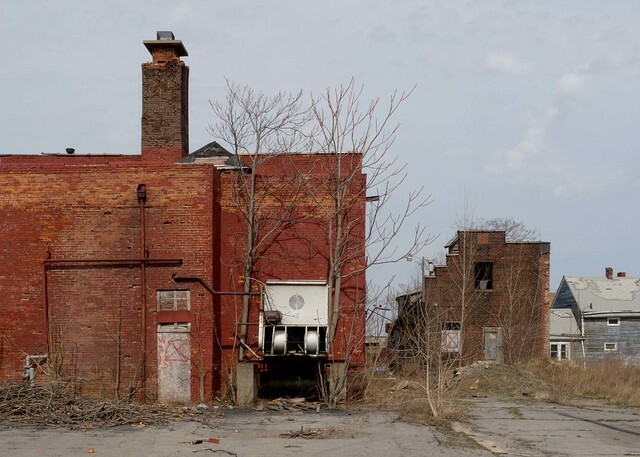 Trico Plant #1 is owned by a subsidiary of the Buffalo Urban Development Corporation (BUDC), which acquired the site in 2007 with an agreement from BNMC to maintain the property. BNMC has reportedly skirted its obligation to keep up repairs, a textbook "demolition by neglect" strategy. BUDC has designated the BNMC the preferred developer of the site. This building is a must save. Daylight factories like Trico Plant #2 and the Larkin Terminal Warehouse are now vital contributors to Buffalo's economic resurgence. Trico #1 can be also be a major ingredient in downtown Buffalo's revitalization, apparently only if BNMC is told to see the light. Mayor Byron W. Brown chairs the Buffalo Urban Development Corp. The buck stops with the Mayor. Here's hoping he can return sanity and common sense to the Buffalo Niagara Medical Campus, before the bulldozers roll. Check out Tielman's recent post on Trico Plant #1 - here. Also, check out a screen shot of this morning's Buffalo Rising post that was swiftly deleted shortly after Matt Enstice complained to the blog's management. The full text of that deleted post is available on Views of Buffalo, Mike Puma's blog.